A few weeks ago, I visited the Tokyo Handmade Bicycle Show. It was a lot of fun seeing what Japanese builders are doing these days. Before we entered the show, we parked our bikes outside. The bike parking area by itself was worth a visit: Virtually every bike was a special, handmade machine. It’s nice to see that they get ridden. Some had more patina than others, but all were remarkable. 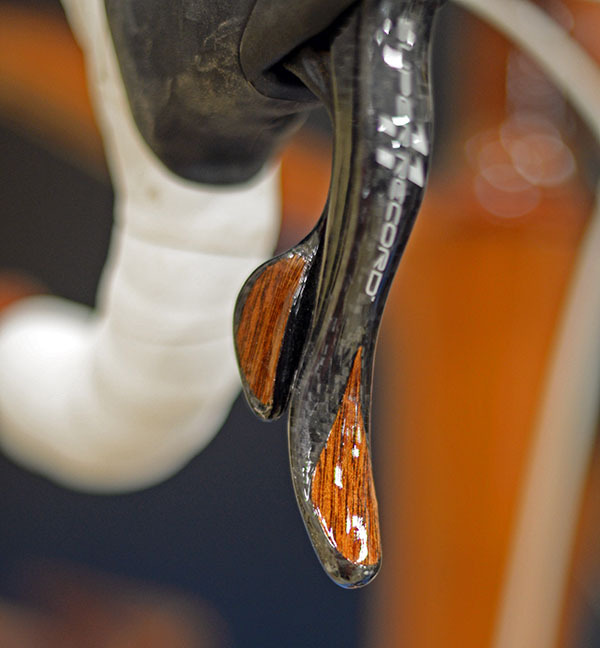 …or a combination of both: The carbon-fiber Ergopower levers are inlaid with wood. The incredible workmanship continued with amazing steel frames from Level and Makino (above). Mr. Makino really takes the art of making bicycle frames to the highest level. His frames are simple, yet exquisitely crafted. The lugs are filed super-thin and crisp, and every part of the frame is shaped to perfection. We talked about a feature for Bicycle Quarterly about his bikes and his shop. Dobbat’s bikes feature neat details and a very cute logo. Montson adds a touch of whimsy with their panniers. They can be removed with one hand and carried as a briefcase. Underneath is this complex rack, custom-made to support the bag. Most Japanese custom builders offer a cyclotouring bike with a bag-support rack – here is Ravanello’s machine. Toei showed that they don’t only build exquisite cyclotouring bikes: Their show bike was equipped with Shimano Di2 and Nitto’s new carbon handlebars. The frame was as beautiful as expected from these masters of their craft. Wooden wheels made another appearance. I was told that these are both comfortable and fast. Maybe I’ll have to try a set! C. S. Hirose showed a fully equipped randonneur bike with his own version of the 1920s Cyclo derailleur (10-speed compatible and super-smooth in its action), custom-made lights and many other interesting features. The other exhibit at Hirose’s stand was a very cute (and very pink) matching pair of bikes for a mother and daughter. The daughter’s tiny machine was fully equipped with cantilever brakes, derailleurs and even a light mount on the front rack. Hirose routed the derailleur cable via this custom-made little pulley, so the levers could be on the top tube – easier to reach for the little girl. Silk showed an interesting “Demontable” frame that comes apart with minimal tools. The bottom bracket shell just contains a bolt that holds the rear triangle. The rear triangle incorporates a second bottom bracket shell, in which the actual BB is mounted. The fork’s steerer tube and stem expander tube are one and the same, so when you unscrew the stem bolt, the fork can be removed. Interesting! Equally exquisite was Watanabe’s show bike, made for a customer with the rarest of rare components, from first-generation Campagnolo Super Record components to a Stronglight crank and bottom bracket with titanium spindle. In Japan, some bicycle collectors like to order new frames which are equipped with classic parts. Gravel and cyclocross bikes are still fairly rare in Japan, but that is changing. The Tokyo Design School showed a ‘cross bike built by one of their students. The photos in the background show the student racing her bike. Cherubim is one of the most creative builders in Japan. The bike in the foreground doesn’t have a seat tube… They also build traditional frames, like the one in the background. … and Cherubim’s owner and head builder, S. Konno. This entry was posted in People who inspired us. Bookmark the permalink. A wonderful post to read on a morning when the temperature tickles twelve below zero. A very interesting post. It would be nice if some of the Japanese bikes, like the one made by C.S. Hirose were available in the U.S., in appropriate sizes for American riders (up to 64 cm seat tube length). These are custom bikes, and the builders insist meeting the customer before they design the bike. If you want a C.S. Hirose, you need to visit his workshop in Tokyo… We had a feature on the builder and his shop in the Autumn 2015 Bicycle Quarterly. Jan, I really enjoyed your whistle-stop tour of the show. Fascinating stuff. Look forward to more posts and articles from Japan. A year or so ago, can’t remember which trip, I had the opportunity to ride a Sanomagic cycle. I was most impressed with the ride and responsiveness. Sueshiro Sano was very anxious to allow me to “test ride” even though I have no hope$ of purchasing. Remarkable bike and builder! I tend to take my vintage bike frames and put modern components on them. I’ve been doing this for four decades simply by replacing that which wears out or fails. Sadly, this has sometimes included the frames, although I do prefer sending them off to a builder for repair. That’s one of the advantages of steel. Clever, but I’m not sure about that disassemblable bike. One’s putting a lot of trust in the bolts, both that they don’t break suddenly and also in assuming that micro movements don’t wear the holes leading to play over time. I really wouldn’t be comfortable with the fork. It seems to amplify the disadvantages of the quill stem system (less solid, and slight movements risk seizing the stem after water, sweat, salt, rain, powergel, etc gets down there) and may increase the stress on the bolt (1) depending on the size of the gap between the stem and the inner fork’s tube and (2) because it now has two roles to play (i.e. also holds the fork in place). I wonder if it needs adjustment after, say, descending a mountain landrover track. I would certainly check. I am an out-and-out fan of the S&S couplings system. It works, with the couplings behaving like proper tubes rather than relying on a bolt or bolts subjected to cyclic stresses, and unlike the “Rinko” idea doesn’t rely on having to, for example, readjust the headset bearings every time as the fork stays in place. S&S couplers are great, but they aren’t perfect: They require a lot more time to disassemble, since you need cable splitters, etc. They cost a lot, and they probably change the flex characteristics of the tubes. The beauty of a Rinko bike is that when it’s assembled, it’s just a bike, with no compromises at all, and not even significant extra cost. I think each system has its place. Really, only the middle one of these is an issue. There are 3 cable splitters, opened or closed with 5 or 6 turns of finger and thumb (~10″ each), and two couplings. No particular care needed, unlike taking the headset to bits and removing the fork. I don’t understand where the idea that they take a long time to dis/assemble comes from. Although S&S couplings were designed to fit in an airline case (total 62″), I have found them brilliant for overland travel as well. I have taken my bike to Europe on sleeper trains (*small* compartments-a full size suitcase is problematic) from Edinburgh to the Alps with the complete bike in a *wheel bag*. If they change the characteristics of the tubes, it’s by a tiny amount not enough to compromise the bike. It’s not remotely rickety, rather, as you say, “it’s just a bike”. They *are* expensive, but the Rinko bike that started this discussion probably isn’t cheap either. It’s worth it. I doubt I’ll ever buy a non-S&S bike again. However, why do they try to ‘reinvent the wheel’ as it were rather then taking up proven and yet affordable designs like the Maxi-Car hubs? Is it still held at the science museum next to the Budokan? There is an impressive bicycle history exhibit on the second floor. They have hobby horses, a Pedersen, and all sorts of old wild designs. That Monstson bike was a gift to his wife. He showed it a few years ago before it was painted. I think he even sewed the bag himself. You’re right about the stuff outside. The people who come tend to bring their coolest bikes. Are they over-represented in the photos, or are simplex retrofrictions as common as they appear over there? And if so, why aren’t they being remade? re: Simplex Retrofrictions–a reintroduced version would look really good with the word “Compass” stamped on it somewhere. So would a roller-bearing headset! Honestly, while I think the rinko bikes shown in BQ and this blog are interesting, you don’t really need any gee-gaws or gizmos beyond some thought and a little practice to be able to disassemble a normal bike (with mudguards & rack, and, admittedly, an Ahead stem) and get it into a rinko bag. I can do this with my bike to make a secure package in less than five minutes, including removing the front guard, handlebars, and pedals. Removing and replacing the fork would take, I estimate, an extra minute. It all goes into a ¥4000 Tioga bag that’s endured many journeys. A dedicated rinko bike might be nice, but IME it’s hardly necessary. You are right, Rinko is possible without any special parts. In fact, the only special parts on my Rinko bike are the Rinko fender nut and the Rinko centerpull brakes. Total extra cost: $ 29 compared to a “non-Rinko” bike. As you mention, there are many Rinko systems, as shown in the Winter 2015 Bicycle Quarterly. It all depends on how small you want to pack the bike. When you are on a crowded train, you appreciate a bag that is 30 cm shorter… and when you fly with the bike, you save significant money if the bag “passes” when the airline employees measure it. Regarding Simplex Retrofriction shifters, I would love to see quality replacement clutch springs being remanufactured!!! Goodness! That is a photo essay for the ages! Thank you very much, and also thank you to all our new digital technology, which makes sharing these ideas so much more immediate!